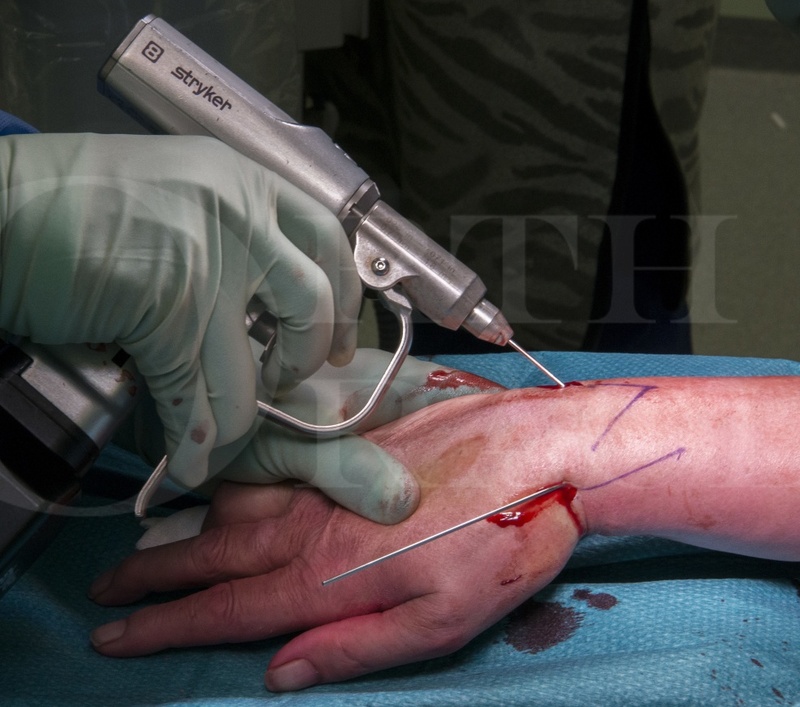 Learn the Distal radius fracture : Manipulation Under Anaesthetic (MUA) and K-wire fixation surgical technique with step by step instructions on OrthOracle. Our e-learning platform contains high resolution images and a certified CME of the Distal radius fracture : Manipulation Under Anaesthetic (MUA) and K-wire fixation surgical procedure. Distal radial fractures are a common injury that have a bimodal age distribution. Younger patients with the injury can be further split into two groups, the paediatric low energy physeal type injuries or young adults with high energy injuries. The most common group by number however, are older osteoporotic adults in the over 60 age group, who are typically female patients. Abraham Colles (1814) first described the dinner fork deformity of the dorsally displaced fracture of the distal radius and this eponym is regularly used. It should however be noted, that this is a clinical deformity diagnosis, as radiographs weren’t discovered until 1895 by Wilhelm Rontgen. In terms of how to manage these injuries, my own surgical practice is informed by the results of the DRAFFT study and subsequent critical appraisal. (Costa M et al. Percutaneous fixation with Kirschner wires versus volar locking plate fixation in adults with dorsally displaced fracture of the distal radius: randomised controlled trial. BMJ. 2014; Aug 5: 349. Fullilove S, Gozzard C. Dorsally displaced fractures of the distal radius: a critical appraisal of the DRAFFT study. Bone Joint J. 2016: 98-B(3); 298-300). In short, if a closed reduction can adequately restore the anatomy and K-wires can control that fracture pattern, then I offer an MUA & K-wiring. If this is not the case, then I use internal fixation or on occasion external fixation, depending upon the fracture, soft tissue and patient specific factors. Those who require early hand function, to aid with weightbearing or return to work. Those who cannot tolerate a cast such as the cognitively impaired. Those who will not be able to return for removal of wires at 4 weeks. Author: Mr Ross Fawdington FRCS Ed (Tr & Orth). Institution: Queen Elizabeth Hospital, Birmingham, UK. Author: Author: Mr Ross Fawdington FRCS Ed (Tr & Orth). Institution: Institution: Queen Elizabeth Hospital, Birmingham, UK.